Photographs taken by the Kansas Department of Economic Development at the Carey Salt Company mine in Hutchinson, Kansas. In one photograph, a man identified as Vernon Horton is seen tamping dynamite into one of a series of holes in the face of the mine room. 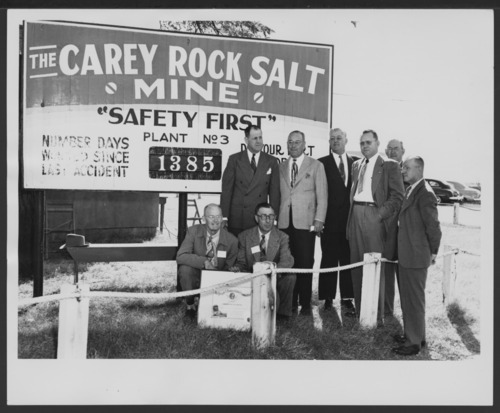 Views of Carey Salt Company - *1 Photograph of a group of men standing in front of a sign that reads "The Carey Rock Salt Mine"